Switzerland has four official languages. This map below from about.ch depicts the portion of Switzerland in which each language is spoken. -The spoken language typically matches what the closest proximate country is. Ex: Geneva is closest to France, so we speak Swiss-French here (blue). This also plays out in the local cuisine of the areas as well. -Some portions of Switzerland are bi-lingual…such as the part near Bern where you can tell its shaded in blue and yellow. It’s really interesting to see the road signs change as you drive into different parts of Switzerland, see below for “exit”. Also, the radio stations change back and forth into different languages as you drive along. 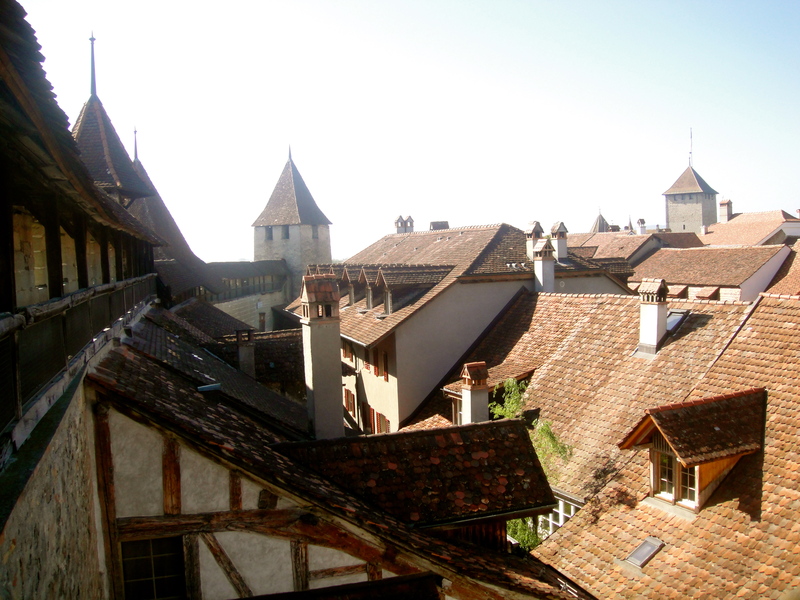 This week, Lady J, S, and I took a little road trip up to Murten, which is just west of Bern, and one of the bilingual areas where 25% speak French and 75% speak Swiss-German. We visited the Old Town and had a nice drink in the main square. When the Swiss-German waitress came for our order, we attempted a little German before she effortlessly slipped into English to take our drink requests. There’s nothing like trilingual waitstaff to make you feel insufficient in life. This happens very commonly in Geneva to Gabe and I, since most Swiss residence know upwards of three languages. As if this isn’t enough to keep track of, the languages that Switzerland speaks have deviations to the original versions. Swiss-French is slightly different than French. French people typically think that Swiss French is more sing-songy and its interpreted as being slower or more “country”. Thank goodness I am in the slow part. I can barely understand it as is. Swiss-German is very different than High German. I have heard that people who know excellent High German have a hard time with Swiss-German. And still, there’s more! Esther taught us in French this week that every one of Switzerland’s 26 cantons speak a different dialect. There are different words and expressions used in different cantons even though the overall “language” is the same. For example, in typical French, petit déjeuner is breakfast, déjeuner is at noon and dîner is in the evening. But, in Geneva, déjeuner is breakfast, le dîner is served at noon and le souper in the evening. There are also different words for post office box and they use different variations of #s (see my prior post on numbers). And this continues throughout Switzerland. While we all speak English, I suppose dialect thing is very common in the US, where people speak differently in Boston vs. Chicago vs. Texas. What words have you found different depending what part of the US you are in? This entry was posted in Cultural Differences, Swiss History & Politics, Switzerland, Travel: Within Switzerland. Bookmark the permalink. Thanks again for the fantastic photos. I feel like I’m traveling to all the beautiful villages with you. You are making great strides in learning French, but I can see how you would feel overwhelmed with all the variations in such a small country.